Detailed pre-wedding planning, full-event coverage, an MC to handle announcements, a wireless microphone for toasts and speeches, music editing where necessary, a clean equipment setup with great sound, and awesome lighting for the dancefloor – All of this, and of course a well-dressed, talented, and experienced DJ that can keep your guests on their feet! This is what each and every one of our clients needs, and can expect regardless of which package they choose. One size does not fit all when it comes to wedding venues and guest lists; bigger spaces need bigger sound. For this reason we have wedding DJ packages that offer equipment upgrade options for sound and dancefloor lighting. Also, because our decorative lighting services are in high demand, we have packages that bundle these options with our DJ service. All of our wedding DJ packages are highly customizable, and we provide a number of other offerings such as Ceremony Mic & Music Setups, Photobooths, Uplighting, Monogram Projection and more that can be added to our “basic” DJ service. Contact us today to discuss your needs and get a BPM Deejays wedding DJ package tailor-made just for you. Our wedding pricing begins at $1195 for the “Marquee” wedding DJ package. Also, much like booking a hotel room, pricing can be dependent on demand for a given date. We have special pricing for holiday, non-Saturday, and off-peak-season weddings. Send an inquiry through our contact page for the most accurate pricing for your wedding date. The tabs below detail the features that are present in all of our Wedding DJ Packages. Please click through the tabs for a thorough description of each feature, and to discover the value of the services that we provide as standard to all of our wedding clients. All of our wedding DJ packages feature “full event coverage”, which is to say that we do not charge an hourly rate. Our DJs book one wedding per day, and dedicate themselves to making it a smashing success. We give ourselves plenty of lead time for setups to ensure that we are ready to perform by the time your guests arrive. As a valued client of BPM Deejays, you will be given access to our online “Client Planning Site”. It is full of resources and information that will help you to build your wedding reception timeline, and make great music selections. In addition, your DJ will always be happy to share advice and ideas with you, either by phone, e-mail, or personal meeting in our comfortable South Side Studio. We do not limit our clients to a certain number of consultations; We want to get to know you and understand your vision for the “Perfect Pittsburgh Wedding”. Need a song shortened for your first dance? Need a questionable lyric removed from an otherwise perfect father/daughter dance tune? How about a special music mix for introductions or a choreographed dance routine? We can do this! 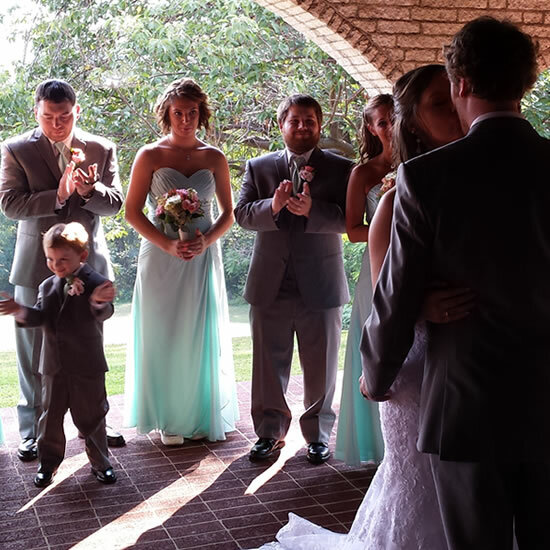 Few wedding DJs in Pittsburgh even have the ability to offer this service, but as masters of music editing, mixing and re-mixing, we include it as a standard feature in all of our DJ wedding packages. It’s that extra bit of polishing that makes a Perfect Pittsburgh Wedding! Playing music is probably less than half of what a wedding DJ has to do to be successful. Once the planning is done, the equipment is in place, and the tux has been donned, your DJ will be at the helm of almost every aspect of your wedding reception. Every prompt, every message to your guests, every detail of your timeline from introductions to toasts, dinner, etc. – the entire flow of the night’s events will be orchestrated by your DJ. Truly, the title “Master of Ceremonies” is more appropriate. For this reason, you need a DJ with a confident, commanding presence on the microphone. Somebody who is prepared to guide the evening according to plan, and prepared to think on their feet if things do not go as planned. Somebody who can communicate, articulate, and take charge with their voice, while maintaining a personable presence. All of BPM Deejays’ wedding clients can take comfort in having that sort of person at their service on their wedding day. This is one of the main things that separates the professionals from the pretenders. Does your DJ have backup equipment on site at your wedding? If so, what is it? Are they relying on an iPod if their main system should fail? Do they have redundancy for every critical piece of equipment? Mixers, speakers, computers, hard drives… all of these things are bound to fail at some point, and any one of them could be a show-stopper if there is not a backup in place. We understand the responsibility that you have trusted us with on your wedding day, and we take seriously our commitment to providing you with the highest level of DJ entertainment available. We would never leave our success in fulfilling that commitment up to chance. We carry viable backups for each piece of equipment that is critical in delivering the performance that we promised. Perfect for weddings with 200 guests or fewer, in a small to medium sized room. The Marquee DJ Wedding Package is both our entry-level, and our flagship offering, with everything you need for an outstanding entertainment experience on your wedding day. An excellent choice for wedding parties of up to 200 guests, the Marquee comes with a powerful, but compact sound system, and lighting adequate for a dancefloor of up to 15′ x 15′. Our Premium PA System delivers up to 2000 watts of clean, clear, sonic power via dual 2-way 15-inch speakers. A five-fixture, computer-controlled lighting system brings visual energy and excitement to your dancefloor area without a large space requirement. A few venues where the Marquee DJ wedding package has been a great fit include: Phipps Conservatory, National Aviary, Carnegie Museums, J Verno Studios, Terrace Room at The Fez, Renaissance Hotel, Sheraton Station Square, The Grand Concourse, Duquesne Club, Salvatore’s. A great choice for weddings approaching 200 or more attendees, larger wedding venues, or couples that just want the extra entertainment factor of a larger sound & light system. Named for the legendary nightclub, Studio 54, the Studio Wedding DJ Package is the perfect choice for bigger rooms, bigger guest-lists, or just for the couple that wants to put on a bigger show. Building upon the high level of DJ service provided in the Marquee, we recommend the Studio package to couples expecting 200 or more guests, and for wedding venues that can accommodate larger sound and dancefloor lighting systems. The addition of dual 18-inch subs to our Premium PA System creates a sound that is more than just “louder”. It is a more muscular, balanced, and defined sound that is superior at any volume. The Studio package provides a significant visual upgrade as well, with double the computer-controlled lighting for your dancefloor. A few venues that are a great fit for the Studio Wedding DJ Package include: Wyndham Grand Pittsburgh, Fairmont Hotel Pittsburgh, Heinz Field, Cherrington Grand Ballroom at Embassy Suites – Moon Township, The Fez Grand Ballroom, Regency Grand Ballroom at Pittsburgh Airport Hyatt, Pittsburgh Airport Doubletree, The Pennsylvanian. Perfect for weddings with 200 guests or fewer, in a small to medium sized room that could benefit from some decorative lighting touches! Named after one of the hottest nightclubs on the Las Vegas strip, the popular XS wedding DJ package combines the services of Pittsburgh’s best wedding DJ entertainment with two of our two most in-demand decorative lighting options: uplighting and monogram projection. A great choice for weddings of up to 200 guests in a small to medium sized ballroom that could benefit from a little glitz and glam! The same Premium PA System as the Marquee package, delivering up to 2000 watts of clean, clear, sonic power via dual 2-way 15-inch speakers. Up to ten (10) LED uplighting fixtures, programmed with a custom color of your choice, and artfully installed to make your reception venue look amazing! A customized monogram projection. Display your new title as Mr & Mrs in crisp, vivid light! A few venues where the XS DJ wedding package has been a great fit include: The Chadwick, Pittsburgh’s Grand Hall At The Priory, Consol Energy Center, Cefalo’s, Duquesne Power Center, Crown Plaza, Greentree Doubletree Hilton, University Club, Hilton Garden Inn Southpointe, Longue Vue Country Club. This is for the wedding where only the biggest and best will do. Bigger sound, bigger light show, extensive uplighting and monogram projection… it’s all in here! As over-the-top as the mythical nightclub for which it is named, the Roxbury Wedding DJ Package can take any space from bland to GRAND! If you are looking for the maximum DJ entertainment and decorative lighting package for a large ballroom, this is it! Premium-Plus PA System – The addition of dual 18-inch subs to our Premium PA System creates a sound that is more than just “louder”. It is a more muscular, balanced, and defined sound that is superior at any volume. The Roxbury package provides a significant visual upgrade as well, with double the computer-controlled lighting for your dancefloor. Up to twenty (20) LED uplighting fixtures, programmed with a custom color of your choice, and artfully installed to make your reception venue look amazing! A few venues that are a great fit for the Roxbury Wedding DJ Package include: Lexus Club at PNC Park, Edgewood Country Club, Soldiers & Sailors Hall and Museum, Stratigos. If you want the most complete, and full-featured photo booth wedding package in Pittsburgh, at an incredible discount, look no further than our “VIP” Package. 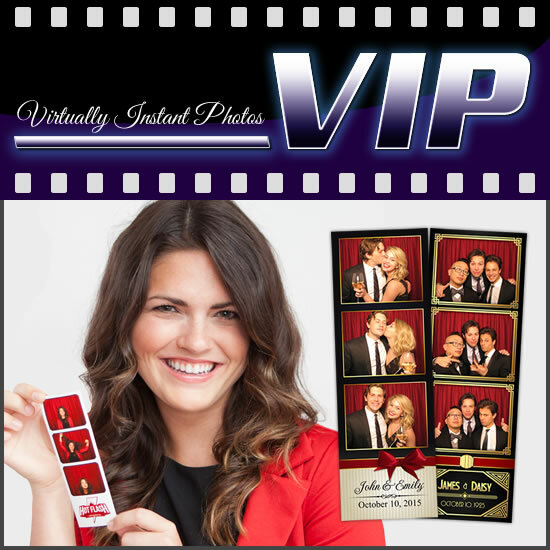 With a generous 5-hour rental time, the VIP Photobooth Package is designed to cover most events from beginning to end. Your guests will be snapping pics from cocktail hour, all the way to the last dance! Costume props, a photo-album, customized photostrip artwork, and unlimited prints are all part of the package. Go first-class all the way… order the VIP with your DJ Wedding Package today! The “VIP” package includes a full five hours of open-booth time, during which your guests are welcome to unlimited photo-sessions. Each session will produce two 2″ x 6″ (two inch by six inch) photostrips. The photostrips print out within seconds, and are ready to be handled immediately. Your fabulous photo booth attendant will place one of the photostrips into your photo-album (also included), and will encourage your guest to write a message into the album. The other photostrip is theirs to keep as a fantastic memento of your special day, and reprints are always available on request! A photo-album is a key feature of any wedding photo booth package, and the VIP package delivers. You will not need to supply a thing, as we have thought of it all! A beautiful, hard-bound, 12″ x 12″ (twelve inch by twelve inch) photo-album. Acid-free, archival-quality cardstock in black. Fine-tipped, silver paint markers by EK. These are the rarest, and best available (or not very available). We went out of our way to source these markers, and spared no expense. It’s a small detail, perhaps, but that is just how we do things. 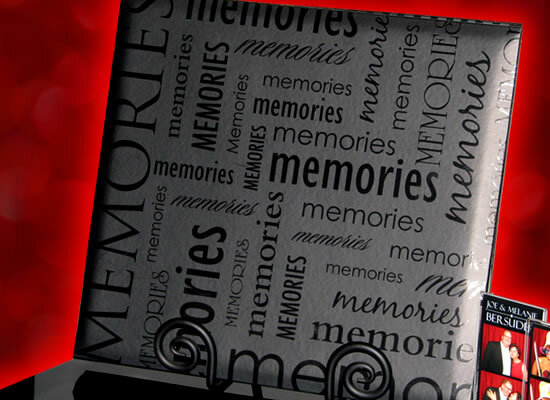 We have done everything in our power to ensure that your photo-album is an heirloom that you can treasure for a lifetime. 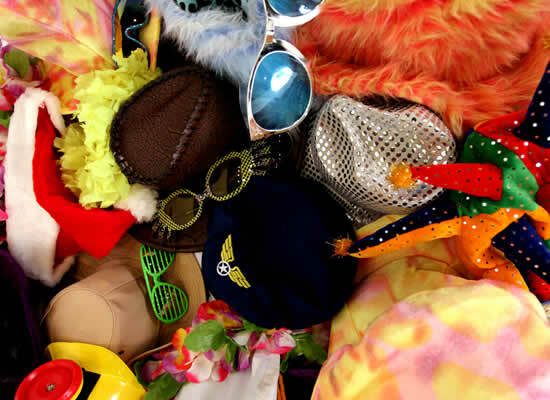 Well, what would a photo booth be without some cool props? Just like every other aspect of our wedding photo booth packages, we didn’t want to leave anything of importance to chance. We have an ever-changing variety of hats, glasses, neck-wear and more. All of the props that we supply are meant to last, and look great for more than just one night. Outgoing, personable, and always appropriately dressed, our friendly and fabulous attendants will make sure that you and your guests get the very best photo booth experience possible. They will instruct your guests on how to operate the booth, and get the best possible photos. They will manage your photo-album, keep the booth area organized, and ensure that everything runs smoothly throughout your event. 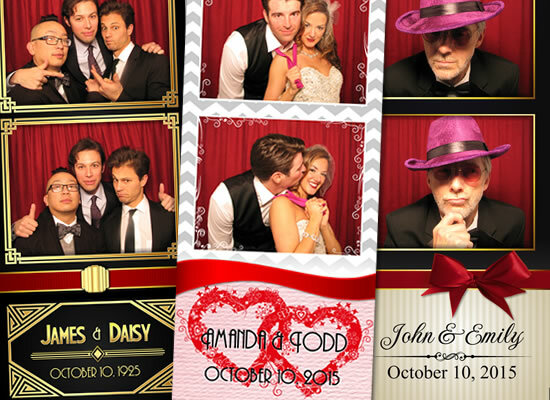 We take pride in having the cleanest and classiest photostrip graphics in the photobooth industry. Every design that we offer is created right here at BPM Deejays / Hot Flash Photobooths, and can be found nowhere else. Additionally, we customize each and every photostrip for our clients, and are willing to work with you to come up with a creative and attractive design that you will love! 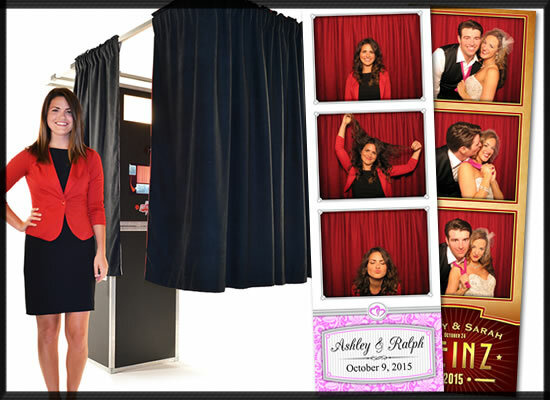 Each one of our photo booth rentals comes with a password-protected online photo-gallery. The gallery will contain every photo taken in our booth during your event, at full resolution. Your guests are welcome to login and enjoy all of the fantastic pics, and they are free to download, share to social media, or even print their favorite photos at no charge! 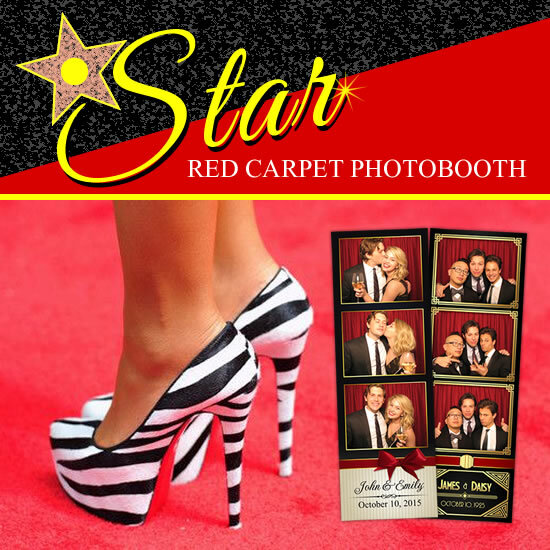 Bring the glamour of a Hollywood red-carpet to your wedding reception with the outrageous STAR Photo Booth Package. Featuring a plush red-carpet, polished chrome stanchions, velvet ropes, and customized “step-and-repeat” backdrop, your guests will swear that they are on the Walk Of Fame! The extra-wide ten foot backdrop means that you will fit the entire bridal party in the photo, and the extra-large 4″x6″ (Four inch by Six inch) photo prints ensure that you will see every smile and detail! Of course, a Luxed-Out photo booth package like the STAR includes all of the great features you would expect: A fabulous attendant, Photo-Album, Costume-Props, Customized Photo-Strip Design, and Online Photo-Gallery are all included. Add one of our Classic-Style Photo booths to your Wedding DJ Package at an outstanding price! The private curtain enclosure can accommodate up to 8 people at a time. Photos print in seconds, and are dry to the touch immediately. The IMAGE Photobooth package is so richly featured that you won’t be left wanting for anything. You will enjoy a full 3 hours of photo booth fun, with unlimited sessions and prints. We provide costume props, a photo-album, customized photostrip artwork and more. 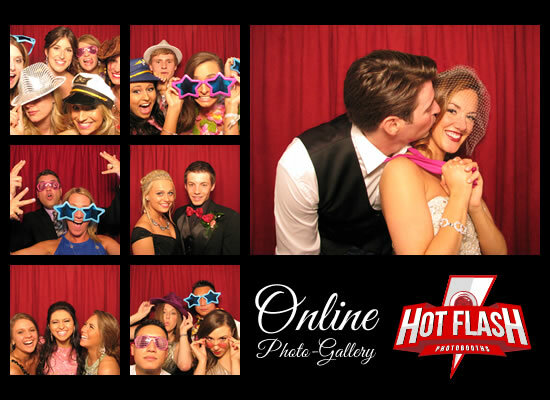 Best of all, you can be assured that everything included in the “IMAGE” package retains all of the high-quality and personal service that has made Hot Flash Photobooths (by BPM Deejays) Pittsburgh’s Favorite Photobooths! 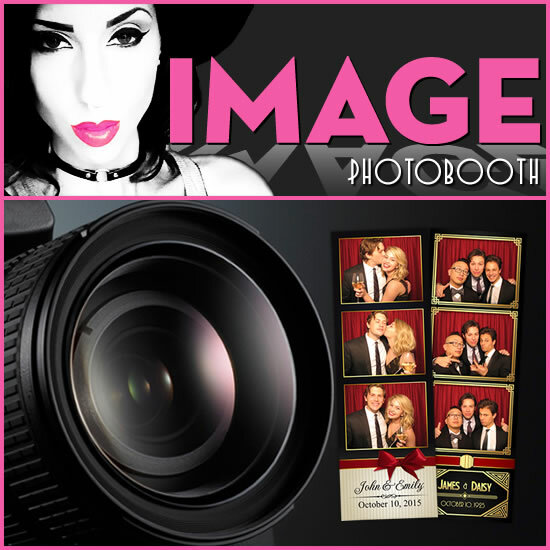 The “IMAGE” package includes a full three hours of open-booth time, during which your guests are welcome to unlimited photo-sessions. Each session will produce two 2″ x 6″ (two inch by six inch) photostrips. The photostrips print out within seconds, and are ready to be handled immediately. Your fabulous photo booth attendant will place one of the photostrips into your photo-album (also included), and will encourage your guest to write a message into the album. The other photostrip is theirs to keep as a fantastic memento of your special day, and reprints are always available on request! A photo-album is a key feature of any wedding photo booth package, and the IMAGE package delivers. You will not need to supply a thing, as we have thought of it all! More and more couples are saving money, and simplifying the logistics of their wedding day by having their wedding ceremony and reception at the same place. You can save and simplify even MORE by hiring us for your ceremony! Find And Hire A Musician. Rent, Transport, Setup And Operate Audio Equipment. Worry If It Will All Work! We can mic your officiant, customize your music selection, and cue each song perfectly in time with the flow of your ceremony, while saving you a lot of effort, money, and stress. Turn all that beige into “All The RAGE!” There simply is not another decorative technique that can transform a room as dramatically and economically as uplighting. Choose pale colors and subtle accents to create an enchanting mood, or go bright and bold for that electric, nightclub ambiance. Whatever your style, we can come up with a design that suits your taste. Your room will look fantastic, and your wedding photos, amazing! Are Safe For Your Guests And Venue. 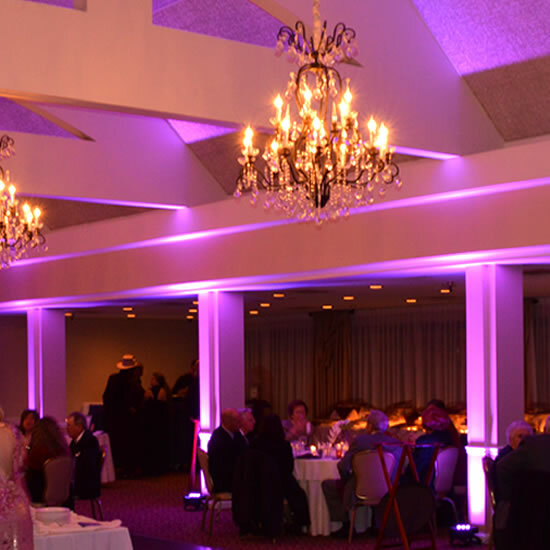 All of our uplighting designs include custom color-programming, delivery, and installation. We are careful to minimize the exposure of equipment and cabling for the best possible appearance and for the safety of your guests. $295 For First 6 Fixtures. Another lighting effect that has gained tremendous popularity over the past couple of years is monogram projection. 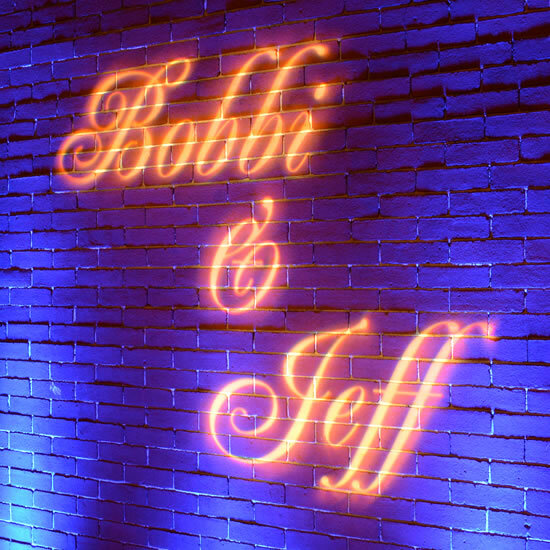 Put your name in lights on the wall, ceiling, dancefloor, or everywhere! We have nearly 100 different design templates to choose from, and are willing to come up with completely customized designs if desired. We use a 750-watt halogen “LEKO” style of fixture for bright, crisp projections that are highly visible, even in a well-lit room. Your custom monogram is etched onto a glass (not steel) GOBO. They are more expensive to produce, but result in a sharper, more fluid design. Order multiples and/or combine with uplighting for an even more breathtaking effect! 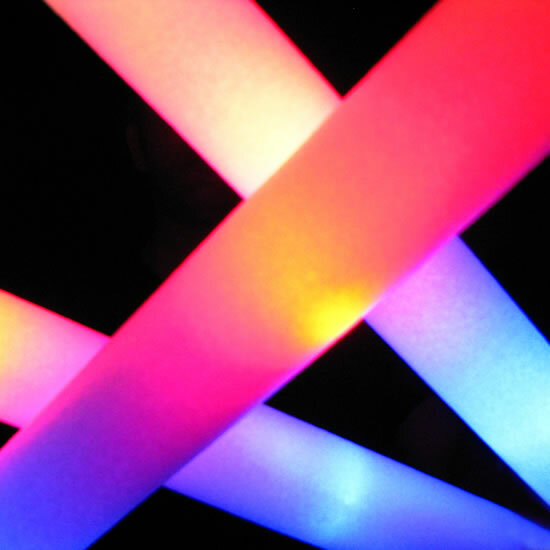 Our LED Glow Batons are huge (18 inches long), and BRIGHT! The have a long-life, replaceable battery, and 3 different color-chase modes. Add some extra hype to your bridal party intros, or order enough for the whole dancefloor. Your guests will absolutely have a blast with these! LED Glow Batons In Action!